This is clearly not a usual virtualisation related blog post. But every now and then I'm asked by either a customer or colleague to have a look at a non virtualisation issue they run into, mostly because the issue is occurring on a virtualised server. In this particular case for some unknown reason, overnight all RemoteApp programs serviced from their "Terminal Services" server suddenly stopped working. When users started a RemoteApp they where prompted for their username and password, after entering these nothing happened. Looking in the Application event log two events were logged for each RemoteApp start attempt. When looking at the first information event (ID 9003) it looks like the Windows Desktop Experience feature is not installed or the service is not started. The second event (ID 9009) is a logical result from the first event, the Window Desktop Manager exits. When searching for the cause of event ID 9003 all I found was that indeed the Windows Desktop Manager Experience probably was not installed or the RemoteApp was being started within a Remote Desktop Session. When looking at the installed Windows features it turned that the feature was installed, I also verified that the service belonging to this were also started and no Remote Desktop sessions were used. The next obvious thing was to recreate one of the RemoteApp programs, to see if this would solve this issue. Unfortunately this did not solve it. Then I started thinking about the description of event ID 9003 "The Desktop Window Manager was unable to start because a composited theme is not in use" and the fact all Internet resources linked this to either the Window Desktop Feature or a not supported desktop theme on the client. For this customer there were no changes to the desktops, although a small change due to a Windows Update / Patch could be possible considering the RemoteApp Programs stopped working at the same time on all workstations. I started searching on the server part where I could define the settings for the Desktop Experience or for the allowed desktop theme's. 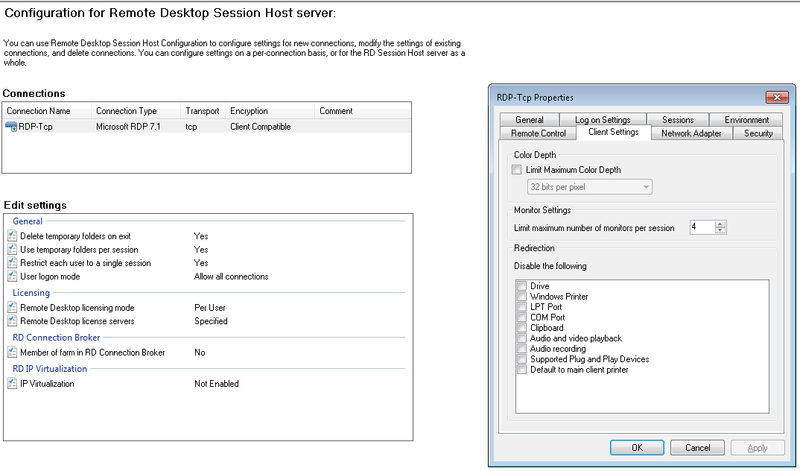 I started at the configuration of the Remote Desktop Session Host server, I opened the properties. And going through the tabs I ended up at the Client Settings tab, were you find the Color Depth limit setting. This setting was set to 32-bit per pixel, I removed this limit by deselecting it. As a result all RemoteApp Programs started working again on all workstations. About the root cause I still have no clue, for now I will keep it at a patch or update on the "Terminal Services" server.